Recently on this website we have looked to the Ancient World in search of the origins of health and fitness. It is likely that weightlifting is as old a pastime as time itself but it’s important to take this into account. So often we take the short view on the history of fitness and date it from the mid to late 1800s. Regardless of what we may think, exercise was part of man’s (and woman’s) life two thousand years ago just as it is today. In fact archaeologists have uncovered bronze objects dating back to 5000 BC that are not unlike the dumbbells we use today. Lifting heavy things up and down is as natural to human beings as walking or running. It is perhaps unsurprising that very quickly in the history of mankind, people began to realise that the stronger a muscle is, the heavier the object that can be lifted. Thus the idea of weight lifting was born. Having looked at Athens and Rome in previous posts, today we will examine Ancient China, Mesopotamia and Ancient Egypt. In China, much like in Rome or Athens, soldiers engaged in various kinds of weight training to prepare themselves for battle. In fact, historians have uncovered Chinese documents dating back to 3600 BC detailing an exercise routine for soldiers. Such was the importance placed upon physical exercise by the Chinese army that in later centuries, potential soldiers were required to pass an examination based upon weightlifting texts if they were to enter military service. But weightlifting was not just confined to the Chinese army, as a cursory glance through Chinese history suggests that strength contests were also an important aspect of Ancient Chinese life in the village. In fact, during the period of the Warring States (770BC to 221 BC) ‘Qiao Guan’ and ‘Kang Ding’ grew in popularity amongst peasants and farmers. Qiao Guan could be likened to a form of weightlifting except that instead of a barbell, lifters used a ‘guan’, which was essentially a heavy door bar. The weightlifter would grasp the guan at one end with one hand and lift the weight…or at least attempt to. If single handed lifting wasn’t your thing, Kang Ding was the alternative. Here the weightlifter grasped a heavy meat-cooking vessel (the ‘ding’) with two handles and lifted it off the ground. The weights used during such contests were legendary. In Qin, the Chinese State where Kang Ding is said to have originated, a man (power-lifter?) named Wuhuo allegedly lifted a ‘ding’ weighing 500 kilos. 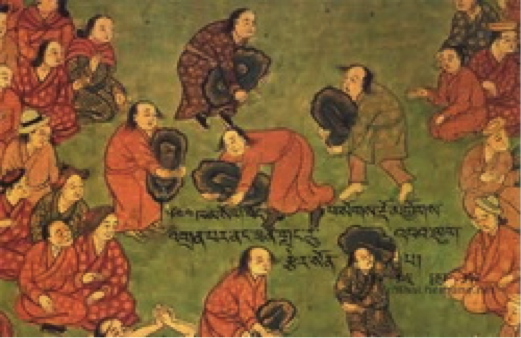 As time went on, more and more people became active in weightlifting and records show that during the Han Dynasty (206 BC to 220 AD), a number of professional weightlifting and power-lifting clubs began to emerge. Other forms of weightlifting from this time included pulling up trees from the ground and lifting up deer. That being said, Qiao Guan remained the most popular weightlifting activity until the Tang Dynasty (618 -907 AD), when the imperial court warriors began to engage in other contests of strength. It was also around this time that weightlifting became a subject of cadet examinations. As matters became more formalised the door bars used during Qiao Guan were replaced by weights made according to prescribed specifications. Much in the same way your gym has dumbbells going up from 5kg to 10kg to 15kg etc. These prescribed weights wouldn’t look out of place in your modern gym. Yang Shi Yong has written about the lifting of wooden bars with big stones at both ends during the Ming Dynasty (1368 to 1644). Similar enough to your modern barbell. It was during the Ming Dynasty that stone ‘barbells’ anywhere weighing from 100 to 150 kilos came into being. Records also exist of such stone weights being used during the Qing Dynasty (1644 -1911). Artwork left behind by the Sumerians, (the first people to leave traces of their civilization which dates to about 3500 BC) suggests that like their Chinese counterparts, the ancient Mesopotamians were also concerned with health and fitness. Artwork and murals left behind depicts Sumerians engaged in several different feats of strength and health. Whilst the intention of the artists of such works is lost in the sands of time, modern interpretations believe such murals were created to depict the skill and strength of the ruling classes and hence scare away any potential enemies. It seems that in the Ancient World, strength and fitness were a matter of life and death. 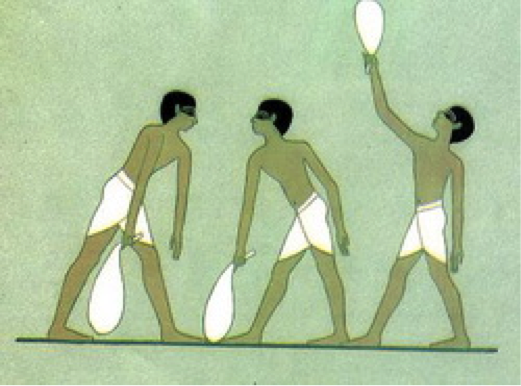 In Ancient Egypt, weightlifting was one of many sports engaged in by the locals. In fact so widespread was weightlifting in Ancient Egypt that some scholars believe weightlifting spread from Egypt to far flung places like Rome, Greece, Cathage and Phoenicia. Egypt could hold a claim to being one of the birthplaces of modern weightlifting. The above mural dates back to around 3500 BC and several artworks found within the tomb depict both men and women exercising with weights. Later tombs such as Prince Bagti III’s tomb from 2040 BC also depicted the Egyptian populace exercising with weights. So there you have it, a brief history of weightlifting in the Ancient World. Many thanks! It’s fascinating and something I was ignorant about for so long.